Is it time to do that bathroom remodeling you’ve always been wanting to have done? If you are wanting to renovate your bathroom into a sanctuary of comfort and style that is both functional and something that you can be proud of, then choose DeYoung Brothers Construction to do your bathroom remodeling for you. Bathroom remodeling is one of the most popular home remodeling projects. And, it’s one of the best ways to get a return on your investment if you were to sell your home. Whenever we start a bathroom remodeling project, we begin with the initial consultation to find out what you are wishing to have done to it, bathroom space area, and then what your budget is. After the meeting we begin the process of creating a bathroom design based on your input and requirements to present to you for approval. 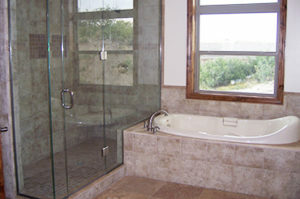 Once we have your vision designed we then begin the bathroom remodeling project right away. DeYoung Brothers Construction is licensed and insured & have been in business since 2002. Our dedication to our customers whenever we do a bathroom remodeling is to always give them high quality work at an affordable price.